Nonpareils get stuck in my teef. And there are dots on them. FREAKY. 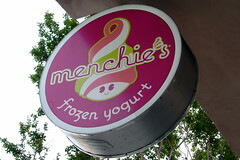 We have a frozen yogurt place here but sadly it doesn't taste like the soft serve frozen yogurt I am used to in Nor Cal. It actually tasted like yogurt that had been frozen. WTH?! So now I am back to eating ice cream. Heehee. Now you have to Yelp it. @justjenn: I love ya, but getting freaked out over nonpareils is just weird! @sizzle: Most of our yogurt places (e.g. pinkberry) sell the tart stuff. It's okay, but I was happy to get some sweet frozen yogurt! @nicole: Nah. It's already been done over 40 times, so I don't feel the need. 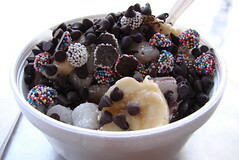 are you sure there is actual frozen yogurt in there under all the chocolate?? Yum, but my skin would protesteth greatly!